Heat oil in a frying pan over medium-high heat. Cook onion, stirring, for 3 minutes or until softened. Add mince. Cook, stirring with a wooden spoon to break up mince, for 8 minutes or until browned. Add carrot, zucchini and celery. Cook, stirring, for 3 minutes. Add tomato paste, tomato and stock. Stir to combine. Reduce heat to medium-low. Cover. Simmer for 15 minutes or until vegetables are tender. Preheat oven to 200°C/180°C fan-forced. Meanwhile, cook potato in a large saucepan of boiling water for 8 to 10 minutes or until tender. Drain. Return to saucepan over low heat. Mash. Stir in milk and butter. Remove from heat. 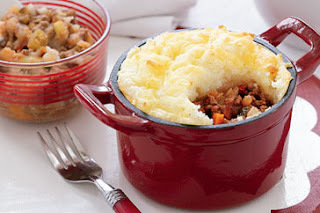 Spoon mince mixture into four 1 3/4 cup capacity ovenproof dishes. Top with mash. Sprinkle with cheese. Bake for 15 to 20 minutes or until golden. For babies: Blend or process pie until smooth. For older babies, roughly mash. For adults: Season with salt and pepper. Serve with mixed salad leaves.